Beaphar Liver Flavoured Joint Tablets contain a vet strength formula to help maintain your dog's joints and keep them supple for smooth, pain free movement. Each tablet contains high levels of Glucosamine which aids in the product and rebuilding of cartilage, allowing for smoother joint movement. The tablets are also rich in chondroitin, which aside from its anti-inflammatory properties, will also help to maintain cartilage and keep ligaments and muscles strong. 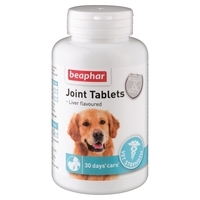 Beaphar Joint Tablets are chewable and infused with a tasty liver flavour and do not have to be given with food. Each pot contains 60 Tablets.